Packed with all the features of Southworth's stationary lifts, The Backsaver Lite Portables feature a small footprint along with four easy rolling 5" phenolic casters for unmatched maneuverability. The internal DC power unit with intergral charger features push button control to quickly and gently raise and lower loads. Units also feature comfort grip handles, corner bumpers and a center mounted positive floor lock. 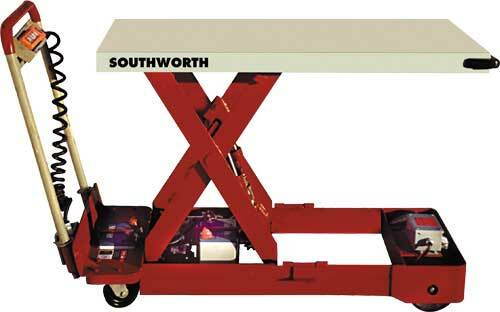 For applications that require a single lift table to be in different locations, Southworth manufactures the Backsaver Lite Powered Portable Lift. A powered drive unit allows one person to effortlessly move the lift table from one work cell to another as often as necessary.